Have you ever gotten to the end of a big job and suddenly found yourself in a major cash flow crunch? 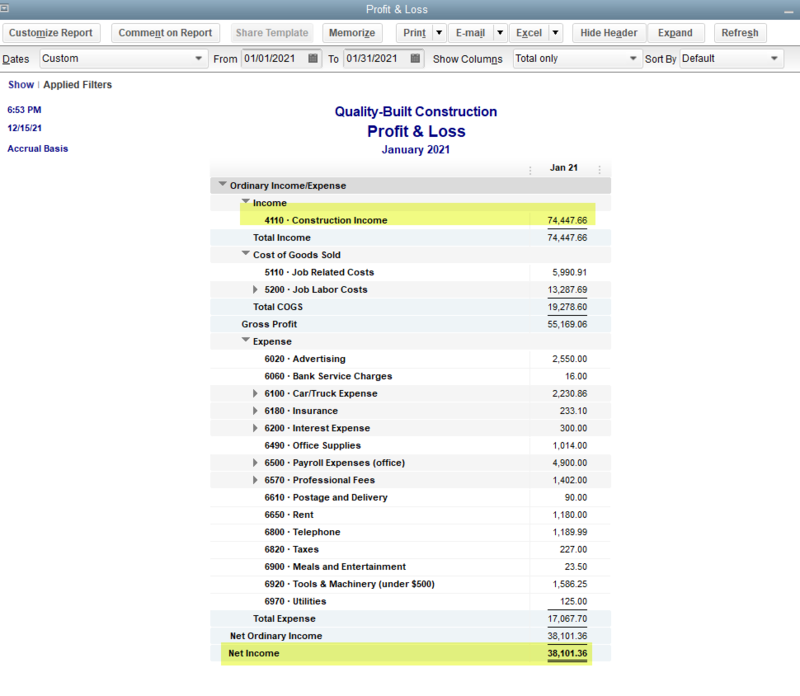 Are you frustrated because when you look at your Profit and Loss report it makes NO SENSE? There’s a very good reason for this and it’s not your analytical skills: In the contracting business, it’s likely that at any given period of time, the costs you’ve incurred rarely line up with the revenue you’ve invoiced for. Oftentimes, draw schedules are heavily front-loaded: You are drawing ahead for costs that you will soon incur. This is great until the job nears completion, when you’ve already collected the money, but still have to pay all of the costs to finish the job. During the earlier months of the job, you are often over-billed, and near the end, you are under-billed. It’s not just you, this report doesn’t make any sense and it’s probably not accurate. How can you LOSE over $14k in November and make a profit of $111k in October? These numbers are all over the place. 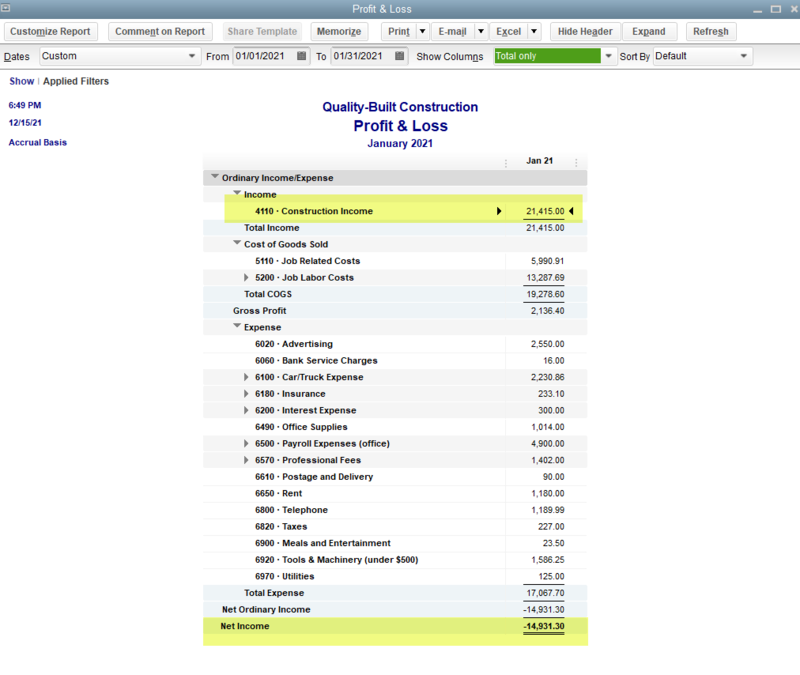 I look at the financial reports for different contractors every day (it’s fun for me, really). All over the country, all different types and sizes, and this is what they look like 99% of the time. You know why it happens: Maybe, you invoiced a client $100k in October, but actually incurred most of the costs for that draw in November. For most contractors, this is just the way it is. All the time. There are probably multiple jobs involved and different jobs involved in each period at varying levels of over and under billing. The only way I know to get accurate financial statements in this situation is to make regular (monthly) over and under billing adjustments. I won’t lie, it is work and it’s somewhat tricky. In my Job Costing Intensive Program, I’ve got a video on this and a nifty spreadsheet. In this article I’m going to give you exact instructions on how to make this adjustment. I should mention that this is for Contractors who operate their accounting on a percentage of completion basis: You recognize your revenue AND costs during any period based upon a % of completion of your jobs. This is true for most Contractors who are not building speculative projects. I did not include all of the jobs from the Estimates vs. Actuals summary, because I am not going to include any jobs that have been completed during this period. If the costs and revenue are at 100%, I’m going to presume the job was completed during or before this period and no % of completion is needed on a completed job. 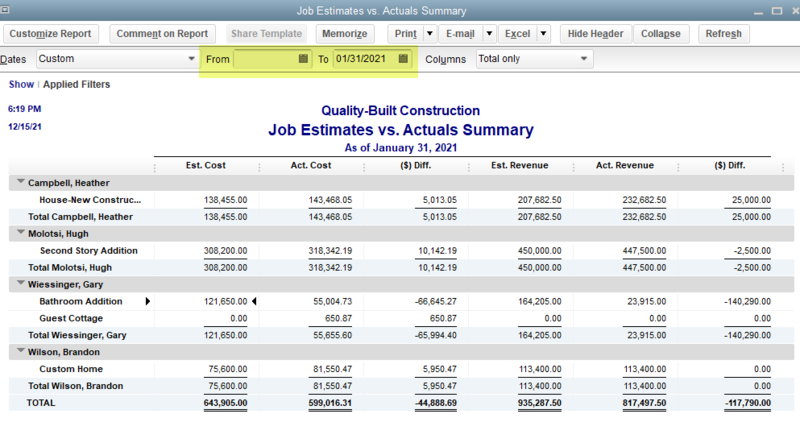 Note: Estimates that have been made inactive will not show on Estimates vs. Actuals report. The Molotsi job costs EXCEED the estimated costs. This system does not in itself account for cost overages and it’s really skewing my % of completion of costs vs. revenue. In this scenario, I’m going to analyze this job more closely and recognize a known cost overrun of $10k by increasing my estimated cost by $10k, making the estimated costs $318,200 instead of the original $308,200. I know what you are thinking: “You lost me at REVERSE the entry” (well, maybe I lost you a bit before, but I swear it’s not as complicated as it seems). Here’s why we reverse the entry – because we’re going to do the whole thing again next month. That reversal brings us back to square one. We need to be at square one, because we will likely invoice for this under-billing in February and we know the costs have already happened in January or some point before that. It’s also why it’s important to do this EVERY MONTH. Otherwise, February could be terribly skewed. If you are still with me, Bravo! I KNOW this is a lot to take in, particularly if your accounting experience is limited. It is, however, what you must do if you ever want to see a Profit and Loss report that truly represents what is happening in your business. It’s really the only way to know whether or not you are actually profitable! And, here’s the thing: If this is a little over your head, that’s ok. You can hire someone to do this for you (MEEE! ), or to teach you how to do this (MEEE!). This is the type of service I offer to my Outsourced CFO customers and I’ve got videos on this in my Job Costing Intensive Program. You aren’t necessarily going to completely “get” all of this stuff the first, second, or even 10th time and that’s OK. This is why I often work with clients over time. 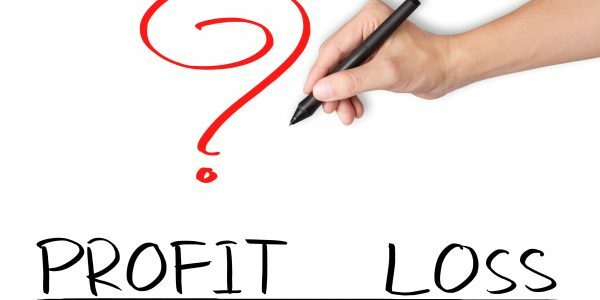 The Profit and Loss Report, as important as it is, is only a piece of the puzzle. I highly encourage you to read my other articles in this series: Why Focusing Only On Job Cost Reports Is A Big Mistake, Assigning Overhead to Job Cost Reports – Don’t Do it!, and Margin vs. Mark up for Contractors.